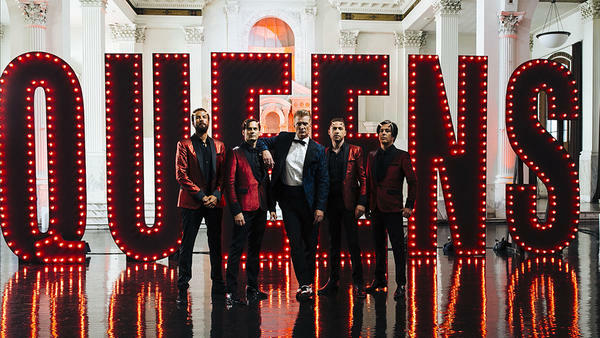 Queens of the Stone Age, led by Josh Homme (center). The band's new album Villains was released August 25. There has been cause for celebration: The frontman and founder of Queens of the Stone Age produced a record with and toured with his childhood idol, Iggy Pop. But there has also been tragedy. Homme's other band, the Eagles of Death Metal, was playing at the Bataclan during the horrific Paris attacks almost two years ago. Though Homme was not there that night, he still does not talk about it. The new Queens of the Stone Age album, Villains, shows few signs of that darkness. The upbeat, even dancey record was produced by Mark Ronson, who famously worked with Amy Winehouse, Adele and Lady Gaga before working on Villains. Homme talked to NPR's Kelly McEvers about the band's "orbital" approach to the music on Villains, working with Iggy Pop and why he won't discuss the 2015 attack at the Bataclan. Hear the conversation at the audio link or read an edited transcript of the interview below. Kelly McEvers: How did you come to work with Mark Ronson? You're two guys from two very different musical worlds. Josh Homme: He asked me to play on the Lady Gaga record, so I played on about four tracks, five tracks. And I got to watch him work. He's a great communicator. I've kind of banked everything on music being my religion and my philosophy and my way to leave baggage behind and learn something. He was very understanding of that and I think he got excited at that reality. Plus he dresses like a gangster on vacation, so he looks very handsome. All the time! He's got the best hair. Yeah, he's willing to go the extra hair mile. You are a rock 'n' roll dude. You don't have your leather jacket on today, but you've got your tatted hands, you've got your serious cane that looks like it could maybe hurt somebody. I've seen and done things. Right. [Laughs.] But you have this new album! And it's kind of electronic and dancey. Yeah, I mean, normally we have three guitar players. Lynyrd Skynyrd did three guitar players wonderfully but it's difficult to do. So while two guitars are going, when a vocal leaves, something needs to vocalize and carry the tune. So we had our keyboard player Dean [Fertita] sort of lead that way in this sort of John Carpenter [way]. You know, John Carpenter did all the soundtracks to his movies, and there were these sort of broken, robotic keyboard sounds — very dental, perhaps, sometimes. I would love an example. I mean, the Halloween soundtracks — everything seems to start with this stark bing bing bing bing, then it goes into these kind of noises. [Imitates noises.] And for us, a song like "Fortress" would be a great example of keyboards leading the way. When I think about your last album, ...Like Clockwork, it was dark. You had some health issues. So what is it that this album is tracking, in terms of your life? Are things just kind of better, and you're in a good place? Is that what's happening? Yeah. What I took from that was — I felt like if I was gonna carry the flag for anything, it was being yourself in the moment. And if there's a moment hanging in the air, grab it and make it yours. Especially after working with Iggy Pop as well, on Post Pop Depression. It was like — say what you want, like and don't like what you want, but I'm going to run — now. Let's talk about working with Iggy Pop. How did that come about? Well, in a very modern way: I got a text. [Laughs.] Wait, what did it say? Because nobody else in the world gets this text. So I feel like we need to linger on this moment for a minute. It said, "Hey, was thinking maybe we could record something. Let me know what you think. Iggy Pop." And if you'd told the 13-year-old me that that was the case, that was gonna happen, I would've gave you the finger and skated off. I wanted to listen to another song that our colleague Gabe says is his new anthem: "The Evil Has Landed." It's definitely rock. There's also this kind of Bryan Ferry thing going on, too. Absolutely, sort of Sly & the Family Stone, perhaps? Using double-time to go half-time. There's something that was really important to me and that I explained to Mark, and that the guys knew early, is that many songs are like a merry-go-round. When the chorus comes back around you've heard it, you're familiar with it, it's the same. Perhaps the words change, perhaps they don't. And for me, this needed to be very orbital, where every time you hear a part, you hear a verse come around, it's only 40 percent the same; it's been altered each time. And the chorus as well. That way, it's more like getting on a bus at a bus stop: You get on one place, you get off somewhere else. And you don't understand what's going to happen at all times. But you feel comfortable; hopefully, you feel comfortable. Yeah — like: I'm on a bus — I know what a bus is. Yeah. "It's my bus." This orbital style — I figured, however we're spinning on the planet, spinning 'round the sun: Let's try this same thing with music. You said you don't like to talk about Bataclan and I'm not going to linger on it too much. But I guess what I want to know is: Why? Why don't you want to talk about it? There's so much that I could not explain, that is not up for discussion, that does not require your opinion, that isn't impacted by my own. There are people's [pauses] kids, which I have — And, I don't talk about the Bataclan because, in some ways, it's the business of the world and in other ways, it's nobody's business. But I can't explain how rough that was in a way that I care what you think, you know? I'm sorry to say it that way. No, I think I see what you mean. And so I just say I don't like to talk about that, because I don't. I hate it. But it didn't change anything for me. It amplified everything and who I am. It sounds like you were like, "All right, let's live. Let's be." Yeah. Yeah. You can't stop what I have coming. NPR Music news assistant Karen Gwee contributed to this story. The past few years have been all over the place for Josh Homme. He's the frontman and founder of the band Queens Of The Stone Age. He produced and toured with Iggy Pop. And his other band, The Eagles of Death Metal, was playing at the Bataclan during the horrific Paris attacks almost two years ago. He wasn't there that night, and he still doesn't like talking about it. But if he's haunted by what happened at the Bataclan, you can't tell by the latest Queens Of The Stone Age album. It's called "Villains." QUEENS OF THE STONE AGE: (Singing) When I first met her, she was 17, 17. MCEVERS: You can thank Mark Ronson for the sound. He famously produced Amy Winehouse, Adele and Lady Gaga before working on "Villians." And when he came into the studio the other day, I asked Homme how two guys from very different musical worlds found each other. JOSH HOMME: He asked me to play on the Lady Gaga record. And so I played on about four tracks, five tracks. And I got to watch him work. He's a great communicator. And I've kind of banked everything on music being my religion and my philosophy and my way to leave baggage behind and learn something. And so he was very understanding of that. And I think he got excited at the - that reality, you know? And he - plus, he dresses like a gangster on vacation, so he looks very handsome. MCEVERS: All the time - he's got the best hair. HOMME: Yeah. He's willing to go the extra hair mile. QUEENS OF THE STONE AGE: (Singing) But it doesn't matter now. Just come and love me how - like the way you use to do. MCEVERS: You are a rock 'n' roll dude. You don't have your leather jacket on today, but you got your - you know, you got your tatted hands. You've got your serious cane that looks like it could maybe hurt somebody. HOMME: I've seen and done things. MCEVERS: Right (laughter). But you have this new album, and it's kind of electronic and dancey (ph). HOMME: Yeah. I mean - well, normally we're - we have three guitar players. And Lynyrd Skynyrd did three guitar players wonderfully, but it's difficult to do. So while two guitars are going - when a vocal leaves, something needs to vocalize and carry the tune. So we had our keyboard player Dean sort of lead that way in this sort of John Carpenter - you know, John Carpenter did all the soundtracks to his movies. And there are these sort of broken, robotic keyboard sounds - very dental, perhaps, sometimes as a sound. MCEVERS: I would love an example. HOMME: Of his or mine? HOMME: ...These kind of noises. And for us - like, a song like "Fortress" would be a great example of keyboards leading the way. QUEENS OF THE STONE AGE: (Singing) If your fortress is under siege, you can always run to me. MCEVERS: When you think about your last album, it was dark. HOMME: Yeah. I had troubles, yeah. MCEVERS: Yeah. You had some health issues. MCEVERS: ...In a good place? Is that what's happening? HOMME: ...On "Post Pop Depression," it was like, say what you want. Like and don't like what you want. But I'm going to run now. IGGY POP: (Singing) All I want to do is tell Gardenia what to do tonight. All I want to do is tell Gardenia what to do tonight. MCEVERS: Let's talk about working with Iggy Pop. Like, how did that come about? HOMME: Well, I mean I got - in a very modern way, I got a text. MCEVERS: (Laughter) Wait. What did it say because, like, nobody else in the world gets this text. So I feel like we need to linger on this moment for a minute. HOMME: It said, hey, I was thinking maybe we could record something. Let me know what you think - Iggy Pop. And if you told the 13-year-old me, you know, that that was the case, that was going to happen, I would have gave you the finger and skated off. MCEVERS: I want to listen to another song that our colleague Gabe says is his new anthem, "The Evil Has Landed." QUEENS OF THE STONE AGE: (Singing) A grand cabaret, the last float on parade 'cause their swing got left behind, every puzzle piece of mind, handshake in facade, play the fool or playing God. For God's sake, just play along. Well, you can have a laugh. Hit it. (Vocalizing). MCEVERS: So again, it's, like - it's definitely rock. There's also this kind of Bryan Ferry kind of thing going on, too. MCEVERS: How did that feel? HOMME: It's sort of a Sly and The Family Stone, perhaps, you know? HOMME: There's something that was really important to me. And many songs are like a merry-go-round. When the chorus comes back around, you've heard it. You're familiar with it. And it's the same. Perhaps the words change. Perhaps they don't. And for me, this needed to be very orbital where every time you hear a part, you hear a verse come around, it's only 40 percent the same, that it's been altered each time in the chorus as well. And that way it's more like getting on a bus at a bus stop. You get on one place. You get off somewhere else. And you don't understand what's going to happen at all times. But you feel comfortable. Hopefully you feel comfortable. MCEVERS: Yeah. You're like, I'm on the bus. MCEVERS: I just don't know - like, I know what a bus is (laughter). MCEVERS: But where is it going? HOMME: This orbital style that - I figured, hell, we're spinning on the planet, spinning around the sun. Let's try the same thing with music, you know? MCEVERS: You said you didn't want to - you don't like to talk about Bataclan. And I'm not going to linger on it too much, but I guess what I want to know is why? Why don't you want to talk about it? HOMME: There's so much that I could not explain, that is not up for discussion, that does not require your opinion. There are people's kids, which I have. HOMME: And I don't talk about the Bataclan because in some ways, it's the business of the world. And in other ways, it's nobody's business, you know? And I can't explain how rough that was in a way that I care what you think, you know? I'm sorry to say it that way. MCEVERS: No, I think I see what you mean. HOMME: And so I just say I don't like to talk about that because I don't. I hate it, you know? But it didn't change anything for me. It amplified everything - who I am. MCEVERS: I mean it sounds like you were like, all right, let's live. Let's be. HOMME: Yeah, yeah. You can't stop what I have coming. QUEENS OF THE STONE AGE: (Singing) Here we come. Here we come. Here we come. MCEVERS: Josh Homme, thank you so much. MCEVERS: That was Joshua Homme of Queens Of The Stone Age about the group's new album, "Villians." HOMME: (Singing) Here we come. Get out of the way - matters not what the people say, matters not... Transcript provided by NPR, Copyright NPR.